Monica has a master's in forensic science with a focus on DNA and a bachelor's in chemical biology. Her interests include biology, the justice system, swing dancing, and the Epic Rap Battles of History. She has two daughters under age 4, a job, and another different job. After that comes blogging. …I can’t help but notice it’s missing a few lines. GMOs are safe. Humans begin as zygotes. And nuclear energy is efficient. The Oyster Creek Nuclear Generating Station in New Jersey opened in 1969. It cost $594 million (in 2017 dollars) and took four years to build. America’s newest nuclear plant, at Watts Bar in Tennessee, opened in 2016. It cost $7 billion and took more than 10 years to complete. What happened? Anti-nuclear activism and regulation. In general, scientists are a lot less concerned about nuclear power than the general public is. According to Pew Research, 65% of AAAS members–including 75% of working engineers and 79% of working physicists Ph.D’s–favor building more nuclear power plants, compared to only 45% of the public. If we are defining “pro-science” as “recognizing and agreeing with the majority view of scientists in the field,” then being pro-science would include being pro-nuclear energy. 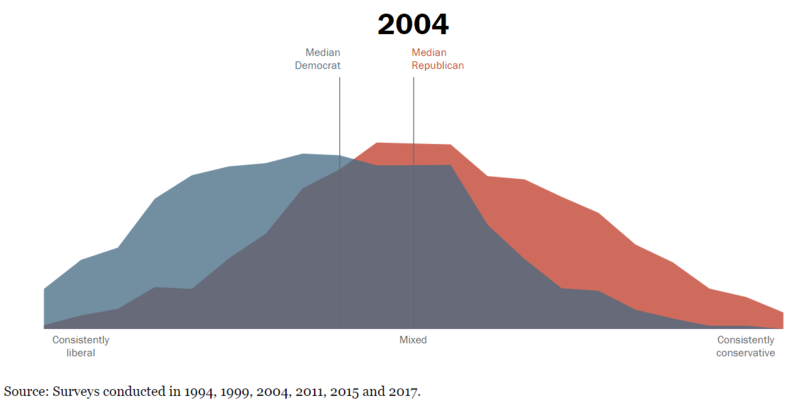 According to Pew Research Center’s surveys, here is how the general public divided along partisan lines in 1994, 2004, 2014, and 2017. A common criticism from both parties has been that the other has become radicalized. Listen to just about any campaign speech and you’ll hear the time-tested demagoguery about how the opposition party is no longer moderate, but instead espouses views from the extreme. So I decided to see whether that’s actually the case. The Pew Research Center does a poll asking Americans about their beliefs on a variety of issues. When plotted on a graph and then animated to show how ideologies have shifted over time, an eye-opening picture emerges. Since 1994, Republicans are only about 8% more conservative in their beliefs. 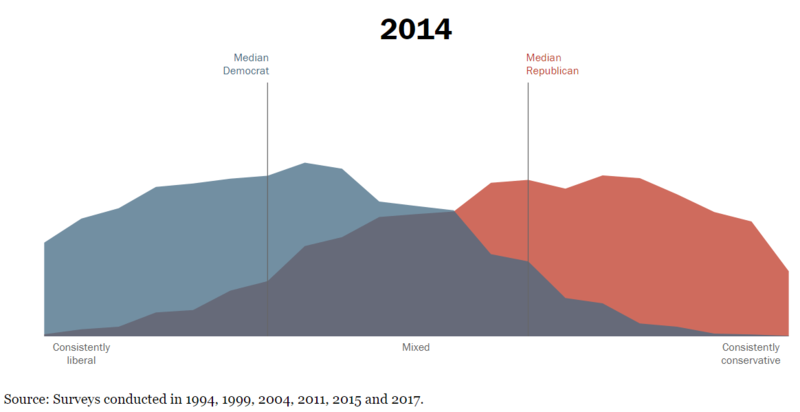 Democrats, meanwhile, are fully 60% more liberal, with the median Democrat now closer to the far left than the center. It wasn’t always this way. 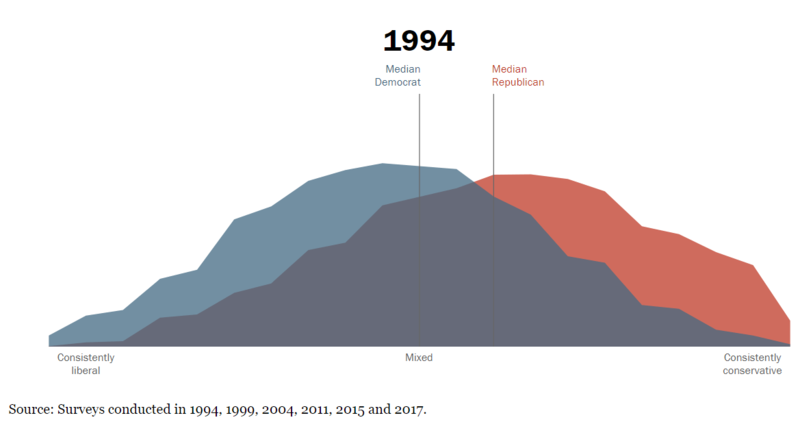 In 1994, the median Democrat was a centrist, holding views that were 50% traditionally liberal, and 50% traditionally conservative. The median Republican was only about 10% more conservative than the median Democrat. Since that time, Republicans shifted left, and were the centrist party in 2004, before drifting back to the right. Today they are just slightly more conservative than in 1994. Democrats, meanwhile, continue to move left, with the biggest surge coming between 2011 and 2017. 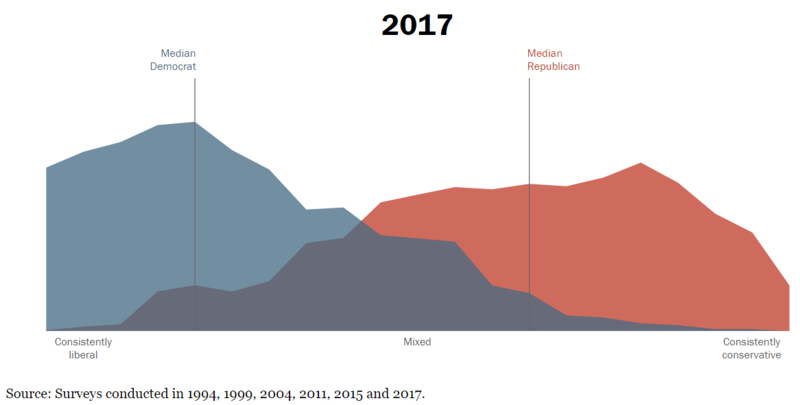 It’s interesting to see how everyone seemed to move left from 1994-2004, followed by the Democrats running in that direction and the Republicans walking it back. I wonder if the party with the President in office tends to shift less while the opposition party tends to react. It would be nice to have more timepoints to see (1996, 2000, 2008, 2012). Even if that were the case, though, it doesn’t look like the shifts cancel each other out as the Oval Office goes from one party to another; instead it looks as if the public is getting more polarized over time. And as a quick aside, I’m not clear on why the Source info includes a survey from 2015 but the data is labeled 2014 instead. The condescension of Hillary Clinton. Joining the ranks of Gloria Steinem and Madeleine Albright before her, Hillary Clinton asserts that if women didn’t vote for her, it must be because they just do what men tell them to. Maybe insulting the demographics you can’t win over will improve your odds in the future. Shortly after the election, I wrote a much more detailed explanation of why white women may have rejected Clinton. Check it out here. Each time our country focuses on the gun debate, a lot of proponents of gun control accuse gun rights advocates of not caring whether people die. It’s my impression that gun control proponents believe gun rights advocates disagree with gun control legislation because we are selfish, insane, and possibly sociopathic. If we cared about saving innocent lives, especially those of school children, why would we fight against common sense gun reform? I’d like to offer a few thoughts on how about half of America could disagree with certain gun control proposals for reasons other than mental or moral defect. 1) Gun rights advocates think of each gun policy in terms of a cost benefit analysis. Is there evidence that Policy X will decrease the frequency or lethality of mass shootings or of gun crime in general? How will the policy affect citizens’ abilities to defend themselves? Is it Constitutional? 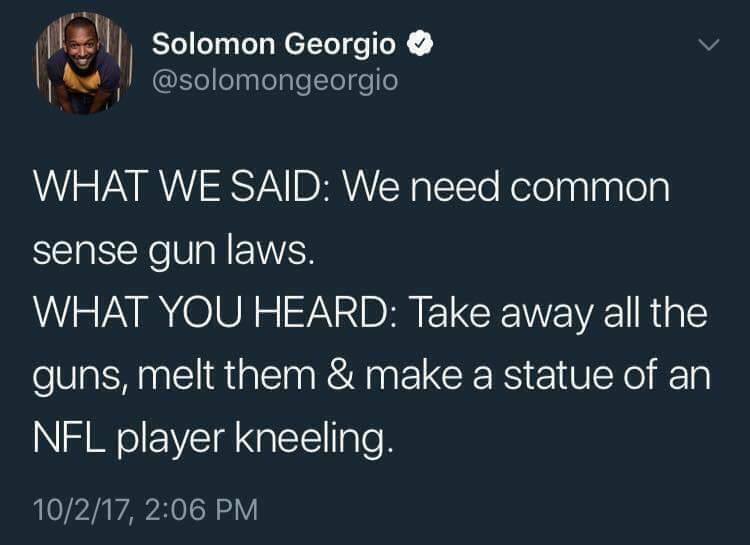 It’s my impression that many gun control advocates don’t view policy proposals the same way. 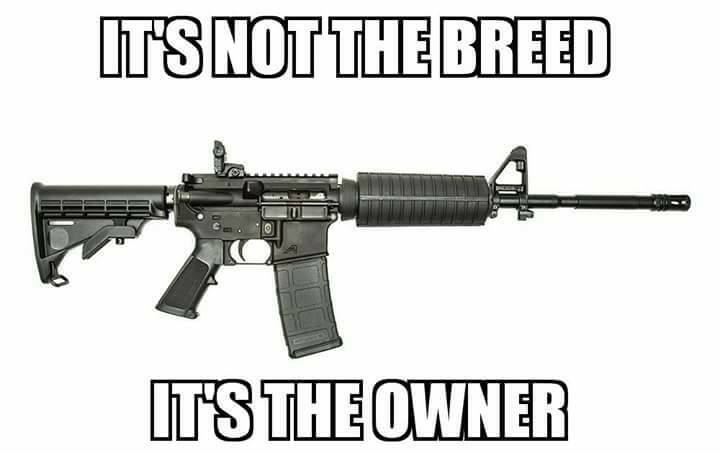 I’ve seen a lot to suggest gun control advocates believe (a) few or no people really use their guns in self defense and (b) either the Constitution has been interpreted incorrectly by SCOTUS or, even if the Founders did intend personal gun ownership, their views were borne of circumstances that no longer apply today. And I expect that if I too thought the factors of self-defense and Constitutionality were greatly exaggerated or even made up, I would view certain gun policies very differently. If you don’t believe the policy will cost anything substantial, you don’t really need to do a cost benefit analysis (and therefore you will have a very different idea of which reforms are “common sense”). I think, generally, that’s how most gun control advocates see this, but I’m open to correction there. 2) There seems to be an asymmetry of knowledge about guns between the gun control and gun rights sides, and it influences whether each side thinks a given policy will be effective or have undesirable side effects. 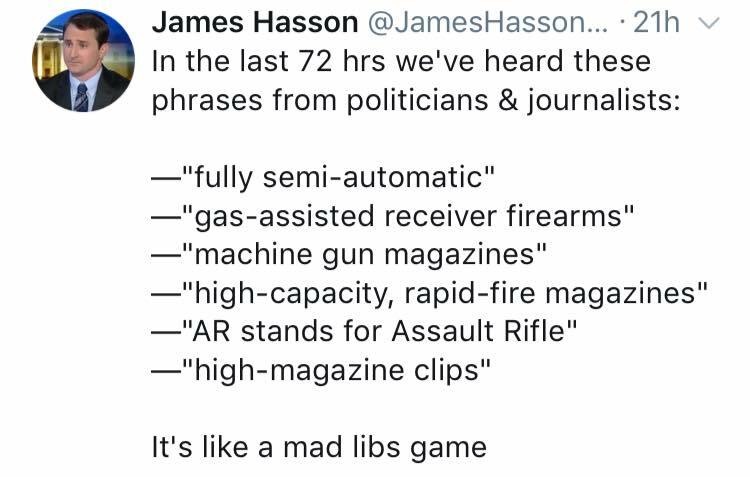 I get how gun rights advocates come off as pedantic when correcting terminology, and it’s easy for me to believe that there are people who really are just trying to feel superior or make the other side feel foolish. But I think the terminology and concepts are a lot more than semantics: they are directly relevant to the effects a given policy will have. The gun control side may feel we’re making a big deal about small details, but it’s hard to discuss gun control proposals if neither our side nor your side is sure what exactly you’re talking about. …just proposed legislation that would ban tens of millions of civilian-owned guns. 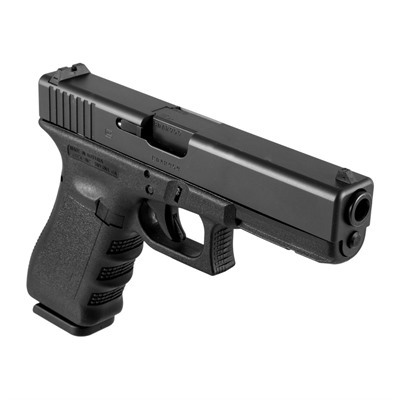 For reference, many of the most recommended pistols bought for home defense and as concealed carry firearms are semi-automatic and can hold more than 10 rounds; it’s also standard for pistols to have detachable magazines. I think for the most part the people who support that legislation don’t even realize that’s what the legislation would do. They believe it would ban only the so-called assault weapons that they further believe are used in most mass shootings. 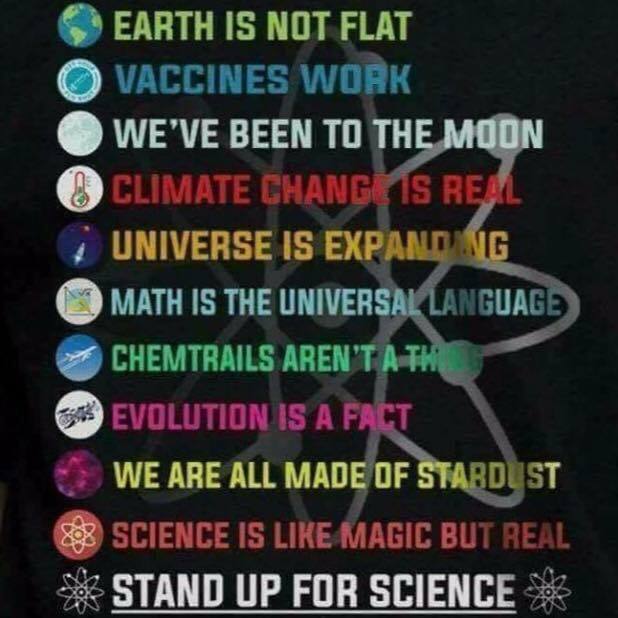 Neither of those beliefs are true. 4) That said, there are proposals that even most gun owners would be fine with. Proposals focusing on who can have guns rather than which guns they can have seem to get pretty broad support. For example, Pew Research has found that most gun owners and non-gun owners alike support proposals focused on background checks, mental health issues, and no-fly lists. Note the measures gun owners support the most all focus on who can access guns rather than which guns citizens can access. More recently there seems to be momentum behind “red flag” measures which would allow authorities to temporarily take guns from people deemed dangerous. Such bills are primarily sponsored by Democrats but are seeing some Republican support too. I think the gun rights side generally believes that proposals that focus on the people rather than the guns are more likely to be both effective and Constitutional. We don’t believe many of these policies would accomplish what proponents claim. We’re worried about inhibiting citizen self-defense. We’re concerned about the Constitutionality of some of these policies. We suspect the people pushing for these reforms don’t understand or care about the full effects of these policies. None of this means we don’t care if innocent people are hurt. That’s why we do support some gun reforms: specifically the policies we believe will best ensure the safety of ourselves and others while respecting Constitutional rights. Follow up on liberal media bias. 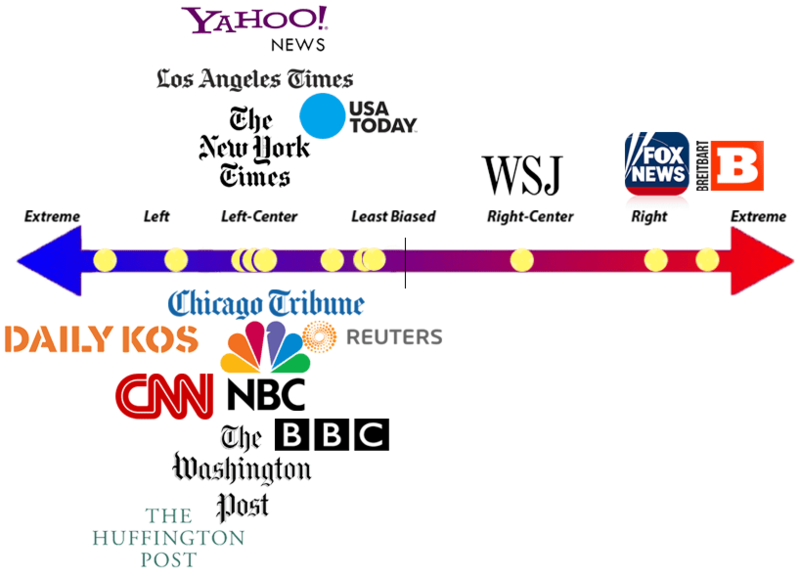 A media bias fact checker found that 12 out of 15 major US news outlets fell on the left side of the spectrum, while the other 3 fell on the right. A little over a year ago I wrote a post looking at some of the evidence for subtle but pervasive liberal bias in media. In that post I referenced a study from Public Opinion Quarterly that found that 13 out of 15 major US news outlets produced more left-leaning articles than right-leaning ones. BBC News – Left-Center bias. Breitbart News Network – Right bias. Chicago Tribune – Left-Center bias. CNN News – Left bias. Daily Kos – Left bias. Fox News – Right bias. Huffington Post – Left bias. Los Angeles Times – Left-Center bias. NBC News – Left-Center bias. New York Times – Left-Center bias. Reuters – Least biased (ranked minimally Left biased). USA Today – Least biased (ranked minimally Left biased). Wall Street Journal – Right-Center bias. The Washington Post – Left-Center bias. Yahoo News – Left-Center bias. Each page in the links above includes a spectrum showing where the given source falls from left to right. If you juxtapose all of the spectra, you get the spectrum above (logos added). In the last week or two I’ve read (or at least skimmed) a lot of interesting pieces on guns, gun crime, gun control, etc. Below are most of the links, listed in order of their publication date. I don’t necessarily agree with or endorse everything in each link (obviously, since some of them are directly contradicting each other), but they gave me a lot to think about, so I’m including them here if anyone else wants to read more. Analysis of Recent Mass Shootings – National Criminal Justice Reference Service, 2013; Study found that up to 77% of mass shootings did not involve an assault weapon or even a high capacity weapon. Stop supporting the Tiahrt order, which keeps the public in the dark about who gun traffickers are and how they operate. Guns and School Safety Survey Results – School Improvement Network, January 23, 2013; a little over 1 in 8 educators (13.5%) both own a firearm and would bring it to school if they were allowed to. 81% were in favor of arming teachers and school administrators who had been properly trained. Colorado’s school shooting — over in 80 seconds – CNN, December 15, 2013; An armed Student Resources Officer responded immediately to a school shooter. Here’s where you’re most likely to own a gun – Business Insider, July 3, 2015; Alaska has the highest percentage of gun ownership; Delaware has the lowest. Illinois school where teacher took down gunman recently trained for active shooters – CBS, September 22, 2017; An unarmed teacher stopped a gunman. How to Reduce Mass Shooting Deaths? Experts Rank Gun Laws – New York Times, October 5, 2017; Experts ranked assault weapons bans as slightly more effective than a ban on all semiautomatic guns. A Cure for Mass Shootings Doesn’t Exist – Reason, February 18, 2018; The author explains why he doesn’t believe an assault weapons ban, background checks for private sales, and broadening the exclusion for mental health problems would curtail mass shootings. Real Solutions for Curtailing Gun Violence – The Wall Street Journal, February 20, 2018; The author suggests dramatically increasing penalties for stealing a firearm, enforcing laws against straw purchases of handguns, and finding practical, legal ways of stoppping people with mentall illness from purchasing firearms. Click on the image to go to the Pew Research Center’s report. How difficult would it be to arm teachers? I’m asking BASIC questions about this idea of arming up teachers and putting amateurs with guns in schools. Questions that any competent gun operator should ask. You want to put more guns, carried by amateurs, into a building packed full of children. I don’t think I’m being unreasonable here. Wright is reflecting the skepticism and indignance of many people. In particular some of my friends who are teachers have made posts clearly stating they do not want to carry weapons to school and are dismayed by the thought. More than one of them have shared this video in response. Click the image to see the public video on Facebook. Assuming any increase in quantity of guns means an increase in danger seems simplistic to me. More guns can increase or decrease danger depending on who is carrying them and why. A gun in the hands of a kid hoping to kill as many people as possible is not equivalent to a gun in the hands of a trained Student Resources Officer or conceal carry permit holder hoping to keep as many people alive as possible. In this context, the phrase “my school” is off-putting. Schools don’t belong only to the teachers working in them; they also belong to the children attending and the parents of those children, especially when we are discussing the best ways to protect our children. I understand there are many parents who do not want armed school staff. And there are many parents who do, like me. My point here is not that the answer is simple, obvious, or unified; my point is teachers don’t have the only say in this debate. We don’t have the resources to arm teachers. The logistics of arming teachers are too difficult to disentangle. Teachers don’t want to be armed. Armed teachers would make schools less safe, not more safe. In terms of the law, as of May 2016, there were 17 states that banned conceal carry guns on college campuses; 1 state (Tennessee) banned students and the public from carryng guns on campus but allowed faculty members to do so; 8 states allowed conceal carry guns; and the remaining 24 states left the decision to the school. Of course this information is for only college campuses, not K-12 schools. The Kingsburg Joint Union High School District in Kingsburg, Ca., is the latest district to pass such a measure. At a school board meeting on Monday, the Fresno Bee reported, members unanimously approved a policy that allows district employees to carry a concealed firearm within school bounds. The employees will be selected by the superintendent, and will have to complete a training and evaluation process. The new policy was made effective immediately. While proposals to arm teachers have been familiar refrains in Texas and Indiana, the passing of such a mandate on the West Coast signals that the strategy is being considered elsewhere in the country. In fact, the Folsom Cordova Unified School District covering the cities of Folsom, Rancho Cordova and Mather, Calif., has allowed employees to bring guns to school since 2010, but only revealed the policy to parents last month. Some people against the idea of arming teachers say it will create an intimidating environment for kids, but note Folsom Cordova’s school district allowed it for 5-6 years before anyone even knew about it. Arming teachers had so little impact on the daily school environment people couldn’t even tell it had happened. In the wake of the most recent shooting, more school boards are following suit, voting unanimously to allow trained employees to carry concealed weapons. People opposed to arming teachers seem to envision a bureaucratic and expensive process that results in an intimidating environment where teachers nervously walk the hallways with rifles over their shoulders. The reality is that arming teachers has so far consisted of allowing those who want to be armed to first get training and then either carry concealed weapons or keep weapons locked in safes. From what I can tell, the individuals who want to be armed cover the costs of the training, permit, and firearm themselves. Again, the school’s resources, logistics, and the teacher’s desire don’t seem to be issues. To my mind, the only real issue is the question of whether allowing teachers to carry concealed weapons will overall increase or decrease student and staff safety. Despite how horrifying school shootings are, they are also exceedingly rare. And while I have no specific data on this, I suspect that even if firearms were permitted on all schools across the country, relatively few teachers and other school staff would choose to carry them. The odds seem very low of a school shooting happening in such a way that an armed staff member would even be present to react. Meanwhile, having legal guns on campus opens the door to accidental injuries. Some of my friends against armed school staff have posted stories about teachers forgetting their firearm or having it stolen while on school property. There’s a cost-benefit question here: if arming teachers increases the chances of accidentally injuring or even killing students but also increases the chances of saving lives during school shootings, how do we quantify those two factors and weigh them against each other? I know of no hard data here. We do know that in our country, in general, guns are used more often in accidental deaths than in justifiable homicide. 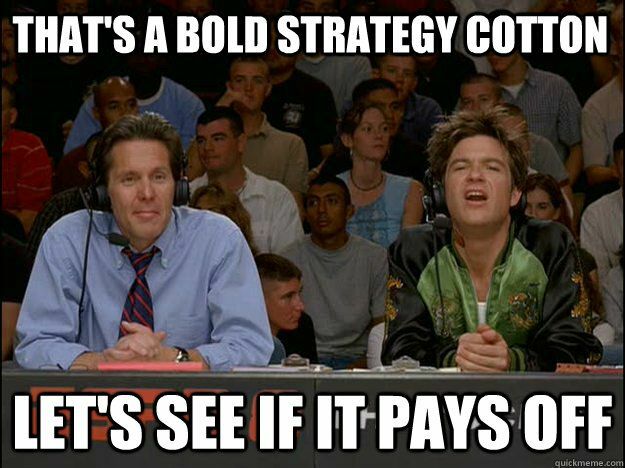 However we aren’t just considering accidental deaths but also accidental injuries, and we aren’t just considering justifiable homicide but also self-defense that involves injuring but not killing the shooter or even not firing the gun at all but brandishing it and getting the shooter to stand down. Additionally the overall statistics for the whole country include people who have received no training in the safe use and storage of firearms, whereas conceal and carry permits typically require training, and individual school districts could require further training as needed. 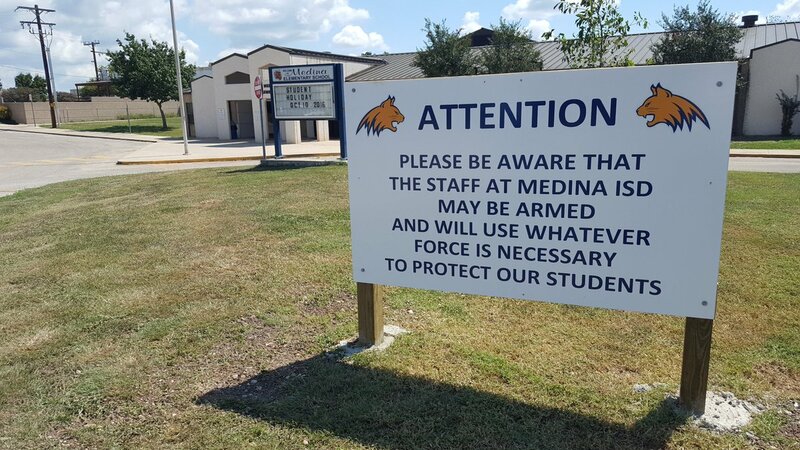 Apparently there are quite a few school districts that have allowed armed staff for years, and I have not been able to find any stories of accidental deaths or even injuries from a teacher’s gun on school property. Meanwhile, it is intuitive to me that if a teacher were to find herself in the position where there is a mass shooter attacking her or her students, both she and her students would have a greater chance of survival if she had a gun than if she did not. When Sandy Hook happened, I cried as I read in absolute horror about Lauren Rousseau and her first graders, completely trapped and defenseless. Even at the time I wondered if it would have been different if she had had a gun. A note here: I don’t want the world we live in, the society we live in, to require first grade teachers to need guns. I don’t want there to be any guns on any school property at all. I don’t want children to have to do active shooter drills, or teachers to have to be trained to recognize gun shots, or parents to drop their kids off and worry if they will be safe each day. It’s awful. It’s infuriating and heartbreaking, and sometimes I can hardly stand to think about it. But I also don’t think we have a way to 100% ensure that deranged or evil people will not be able to show up and try to kill as many unarmed teachers and children as possible. In fact, given our country’s unique relationship with guns, and our relatively unique 2nd amendment, I think preventing such shootings is ridiculously difficult. I still think we should try, but I don’t think our efforts to stem the death toll should be limited only to preventing shooters from showing up in the first place. I think we should also have efforts to address what innocent people can do if a shooter does show up. 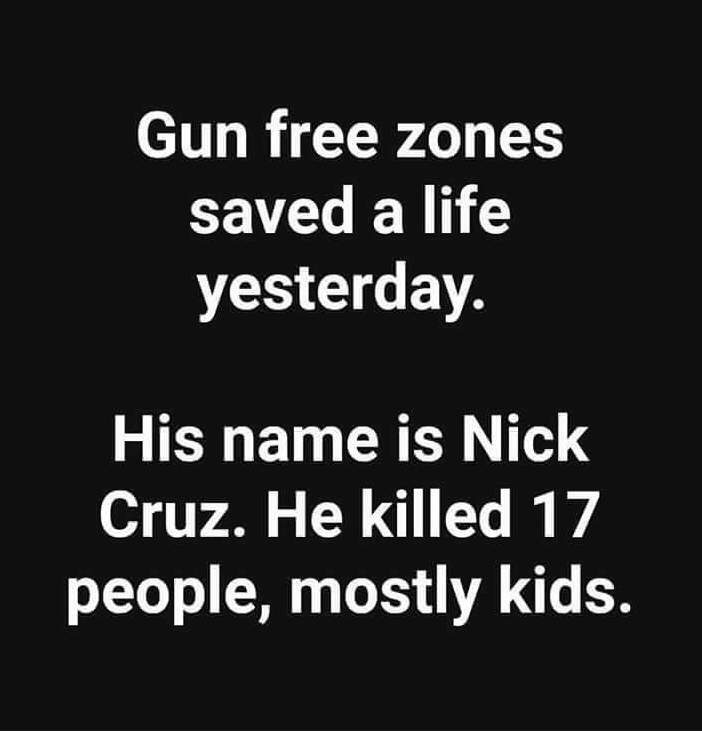 As I write this post, a news story is breaking suggesting that not only did the School Resources Officer fail to engage Nicholas Cruz, but so did three additional deputies present during the shooting. All four officers remained outside the school while Cruz shot unarmed teachers and students. Some opponents to arming teachers point out that if even trained officers struggle to engage a mass shooter, how can we expect teachers to be able to handle it? But this question presumes that teachers get any choice; the reality is that if the shooter is already in the school and breaking into the classroom, the teacher will have to face the shooter anyway. And I can’t help but wonder: if police won’t engage the shooter, how can we disarm teachers and tell them to wait for the police? Should government food assistance programs have nutritional requirements? Some of the foods you can purchase through WIC. There’s good reason to believe that adding nutritional requirements to government food programs is a better use of money and leads to better health outcomes for the people in said programs. WIC (Women, Infants, and Children) is a state-run program that helps low-income women and children purchase healthy food. WIC has specific guidelines for the quantities and types of food recipients can purchase, all of which have to meet certain health standards. In this program there is no way to purchase soda, candy, pizza, baked sweets, ice cream, etc. SNAP (Supplemental Nutrition Assistance Program, often referred to as “food stamps”) is a federally-funded program helping low-income people purchase almost any food. The USDA explains that SNAP is for purchasing any food or food product for home consumption and that this definition includes “soft drinks, candy, cookies, snack crackers, and ice cream” and similar items. Data suggest these types of purchases make up at least 17% of SNAP spending . 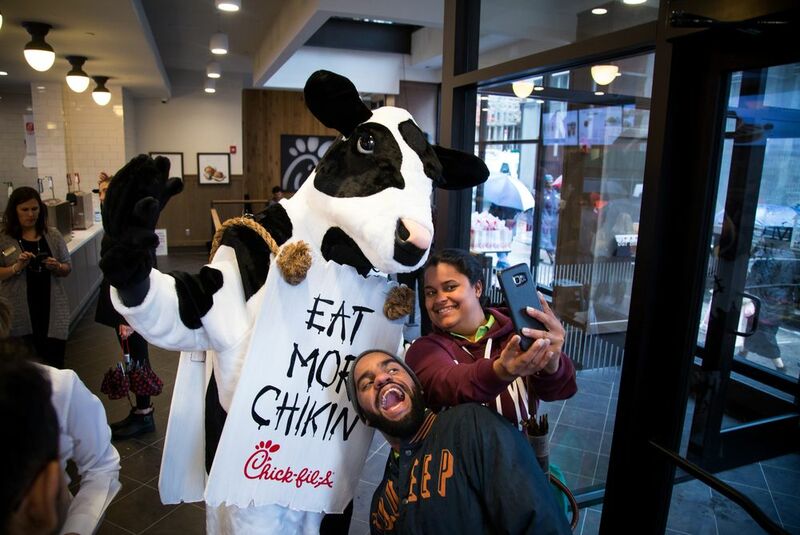 In 2017, about 42 million people used SNAP at an average of $125.79 per person per month, meaning the government spent about $11.3 billion that year buying junk food for low-income people. What are the arguments for spending so much on junk rather than using those funds to ensure low-income people have high quality food? Opponents of SNAP nutritional requirements give many reasons for why nutritional requirements are not feasible or effective: we can’t come up with clear standards for what is “healthy,” it would be too complicated and costly to implement such standards, restrictions wouldn’t stop people from buying unhealthy food with their own money, and people in higher income brackets purchase similar amounts of unhealthy food. Comparing July to December in 2008 and 2011, increases were observed in breastfeeding initiation (72.2-77.5%); delaying introduction of solid foods until after 4 months of age (90.1-93.8%); daily fruit (87.0-91.6%), vegetable (78.1-80.8%), and whole grain consumption (59.0-64.4%) by children aged 1-4 years; and switches from whole milk to low-/nonfat milk by children aged 2-4 years (66.4-69.4%). In 1-year-old children, the proportion ≥95th percentile weight-for-recumbent length decreased from 15.1 to 14.2%; the proportion of children 2- to 4-year-old with body mass index (BMI) ≥95th percentile decreased from 14.6 to 14.2%. The prevalence of obesity among young children from low-income families participating in WIC in U.S. states and territories was 14.5% in 2014. This estimate was higher than the national estimate (8.9%) among all U.S. children in a slightly different age group (2–5 years) based on data from the 2011–2014 National Health and Nutrition Examination Survey (7). Since 2010, statistically significant downward trends in obesity prevalence among WIC young children have been observed overall, in all five racial/ethnic groups, and in 34 of the 56 WIC state agencies, suggesting that prevention initiatives are making progress, potentially by impacting the estimated excess of calories eaten versus energy expended for this vulnerable group (8). Child SNAP recipients consume more sugary beverages, processed meats, and high-fat dairy products, but fewer nuts, seeds, and legumes than income-eligible nonparticipants. Similarly, adult SNAP recipients consume more fruit juice, potatoes, red meat, and sugary beverages, but fewer whole grains than income-eligible nonparticipants. In another study, SNAP participants had lower dietary quality scores overall, and consumed significantly fewer fruits, vegetables, seafood, and plant proteins, but significantly more added sugar than income-eligible nonparticipants. In one study comparing the grocery store purchases of SNAP and WIC households in New England, SNAP households purchased more than double the amount of sugary beverages per month (399 ounces) than WIC households (169 ounces), 72% of which were paid for with SNAP dollars. In a 3-month study, new SNAP participants significantly increased their consumption of refined grains compared with low-income people who did not join. In a study of Hispanic Texan women, SNAP participants consumed 26% more sugary beverages and 38% more sweets and desserts than low-income nonparticipants. 54% of SNAP participants supported removing sugary drinks from SNAP eligibility. In another survey of 522 SNAP stakeholders, 78% of respondents agreed that soda, and 74% agreed that “foods of low nutritional value” such as candy and sugar-sweetened fruit drinks should not be eligible for purchase with benefits. Seventy-seven percent of respondents believed that SNAP benefits should be consistent with the DGAs [Dietary Guidelines for Americans], and 54% thought that SNAP should be reformulated into a defined food package similar to WIC. I want to live in a society where people are healthy and no one goes hungry. SNAP can and should serve both goals. Just a reminder as you travel this holiday season: the TSA is a total waste of money. The following lists are nowhere close to comprehensive. They are just the links I happened to save over time. The first two groups (Fools, Criminals) are only anecdotes and are a small sample over the course of many years. However, the third group (Incompetent) involves larger sample sets and speaks to the central question: Does the TSA keep us safe?